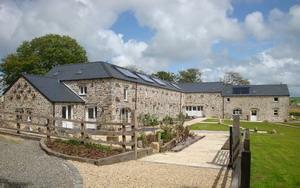 Asheston Eco Barns Self-cateringAsheston Eco Barns are traditional Welsh stone farm buildings providing luxury holiday accommodation in a sustainable environment. The barns have been rebuilt to the highest standard of finish while retaining as much as possible of the traditional character to provide a beautiful setting for a family holiday. One of the drivers when renovating the barns as holiday cottages was to provide a setting for people to have a holiday with minimal impact to the environment. The individual barns all benefit from state of the art environmentally friendly technology. A wind turbine provides the electricity, heating comes from underground geo-thermal heat pumps, hot water from high speed vacuum solar panels, rain water recycling is used to reduce water usage and waste is treated in a bio-digester. The luxury barns have been renovated to obtain a five star grading using traditional building methods and have such features as oak beams, natural slate and limestone floors and eco friendly clay paint. The fittings for the barns are all to the highest standard and are fully equipped with modern kitchens and bathrooms. Asheston Eco Barns are traditional Welsh stone farm buildings providing luxury holiday accommodation in a sustainable environment. The barns have been rebuilt to the highest standard of finish while retaining as much as possible of the traditional character to provide a beautiful setting for a family holiday. Asheston Eco Barns offers a secluded and peaceful environment as it is surrounded by 22 acres of open fields and woodland and has magnificent country views down Brandy Brook valley towards Roch Castle. (c.250 miles) West on M4: Stay on M4 to Bristol, Cardiff & Swansea, follow directions below. Join the M5 from the M6 until you reach the M4 West and then follow directions above. Take A48 to Carmarthen. Take A40 to Narberth / St. Clears onto Haverfordwest. On reaching the roundabout outside Haverfordwest take the right exit signposted to Fishguard. At the next roundabout go straight over towards Fishguard. At the next roundabout by the Withybush business park take second exit to A40 Fishguard. Pass the airport and Texaco garage and 400m on at the Camrose/Clarbeston Road crossroads take the left turn to Camrose. Follow the small country lane down the hill, over a river on a narrow long stone bridge then up a hill until you reach a T-junction where you turn right to Hayscastle Cross. Follow the road until Hayscastle Cross and take the left turn to Brawdy by the “Cross Inn” pub. You will now be in a narrow country lane. Follow this road to Gignog over a Cross Roads down a narrow hill to a valley floor and river. At the river take the next right up the valley side, small signpost to Trefgarn Owen. Again all narrow roads with not too many passing places. Nearing the top of the hill on the right you will see telegraph poles and the turning into Asheston House. Follow the lane down to the bottom. Haverfordwest and Fishguard rail stations are both 20 minutes away. The nearest National Express coach station is Haverfordwest. Taxis are available to Asheston House but and cost c. £25 for the journey. To save time and money try Rocky’s Taxis to pre-book your transport.